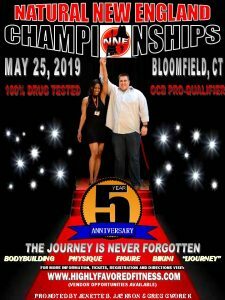 Jenette B. Jackson and Greg Gworek are Celebrating 5 Years of Bringing Health & Fitness to Connecticut! We are extremely excited about once again, showcasing the Natural New England Athletes! EARLYBIRD REGISTRATION IS OPEN & ENDS ON MARCH 30, 2019, SO LET’S GET THOSE ONLINE APPLICATIONS IN!! !